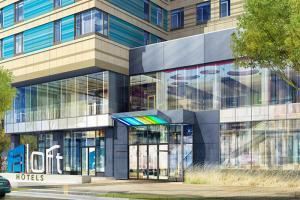 Set in the Seaport District, Aloft Boston Seaport District is just moments away from the Boston Convention and Exhibition Center, Logan Airport, Boston Common and waterfront restaurants. After a day of exploring the city, unwind in one of the modern guest rooms featuring a 42-inch HDTV, nine-foot ceilings, extra-large windows, signature platform bed and Bliss® Spa amenities. For drinks and entertainment, stop by the W XYZ® bar, featuring local emerging artists and live DJs. Located in Boston, just across the street from the Boston Convention and Exhibition Center.